Simone Biles racked up four gold medals and one bronze in her first Olympic quest. She became the only American female gymnast to win four golds in one games. You'd think things couldn't possibly get better, right? And now, she just met her crush Zac Efron. These Olympics have come full-circle for Biles. Efron took pics with the entire U.S. Gymnastics team — and, of course, some solo shots with Biles. Efron even pranked Biled by pretending to take a photo, then kissing her on the cheek last second. She then felt the love even more, sharing another adorable photo of Efron leaning in for another kiss. 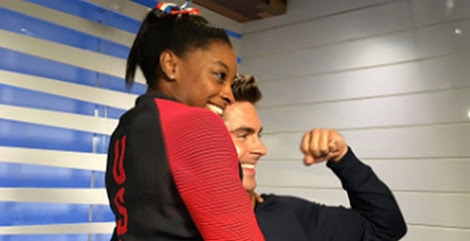 “Just call me Mrs. Efron already,” the gold medal winner captioned. The Neighbors 2 star has been cheering her on throughout the games as well.